I’m a child of the 80’s and back then we weren’t allowed to spend all of our waking days sitting in front of a screen. You had to do inhumane things like … go outside … play with your friends and attempt interaction with humanity. I know you all still go out and meet your friends but I’m sorry groups of kids getting together to jointly stare at their phones doesn’t count. Something else that was quite popular was reading because it was on your parent’s “it shuts them up and doesn’t cost much” list. So what was better than reading? Interactive reading of course! This is where pen and paper, choose your own adventure books came in and the Fighting Fantasy gamebooks were by far my favourites. One of this extensive library was simply called Deathtrap Dungeon. What has this got to do with the price of fish, I hear you ask? Well, take the pen and paper theme, make it a CRPG and shove it onto our screens and you’ve got The Hero of Deathtrap Dungeon and this little beauty is set to release next year. See. I always get to the point eventually. The Hero of Deathtrap Dungeon, which is coming from the crew over at Sentient Play, is the sequel to the gamebook from all those years ago. Very importantly, Ian Livingstone has joined the team. You may or may not know this name but he is one of the founders of the Fighting Fantasy series. If you don’t know him from the books, you may well know him as the president of Eidos. He was the one who grabbed the Tomb Raider and Hitman franchises for the company. Iain McCaig, who is also in on this project, co-wrote Deathtrap Dungeon. He’s an artist and probably more known to you lot for his work on the Star Wars and Avengers movies. The fact that these very talented chaps are working on the title should absolutely keep the game true to form. So what is it? Being a CRPG running on the Storybook Hero RPG engine, it’s bringing the choose your own adventure experience back up to date and offering a cinematic theme to the best parts of “old school” role playing. Continuing the gamebook theme, The Hero of Deathtrap Dungeon, a ‘novel’ RPG, literally writes the story for you as you play based on the actions you take. “We’re a small team, proud of how far we’ve taken The Hero of Deathtrap Dungeon, but now it’s time to call in some specialists – amazing artists, writers, cartographers, animators, and developers to help us take our game to the level so that we can deliver to you the game we have imagined. With your help, we’ll bring The Hero of Deathtrap Dungeon to life in a truly original and amazing way,” said Brad Becker, founder of Sentient Play. This title is currently over on Fig and is looking for a goal of $200,000. There are obviously a lot of people that want to see Sentient Play succeed in this endeavor, as at the time of writing this, they already have 705 backers and $120,312 in the bag. If you want to give them a hand and get involved, just follow the link provided. This title is boasting a fair few features. 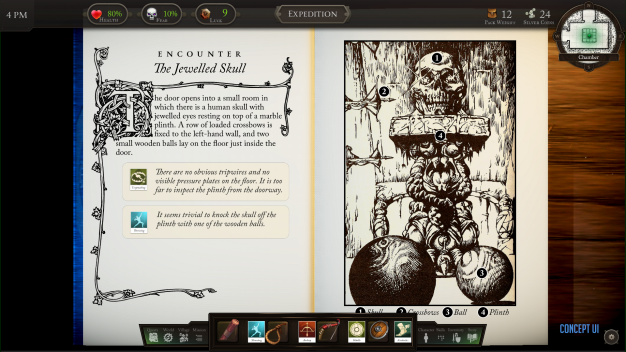 Firstly, you can expect all the wonderful elements of a great RPG; including loot, exploration, quests and much more. Secondly, this isn’t really a linear game. There are multiple solutions to the challenges you’ll be facing and with the use of creativity, wit and strategy you’ll come to one of several solutions. It’s worth noting that this title has a virtual game master. 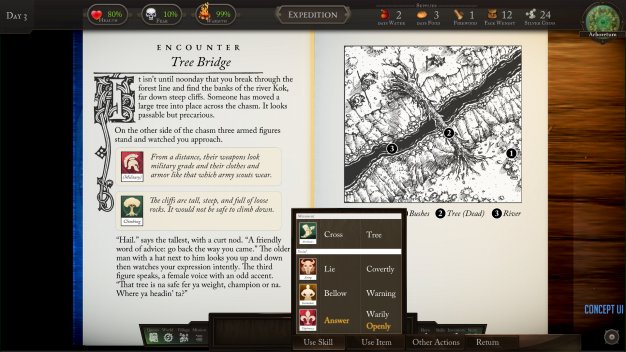 This AI will do all of the statistical stuff for you so you can just enjoy the narrative and beautiful old school, hand drawn, black and white illustrations as you play through the story. The last thing about this title is that just like a book, The Hero of Deathtrap Dungeon will be really easy to pick up and put down. Everything you have done is written for you so you can re-read your adventure should you need to go and do real life stuff. This means that you can just pick up from where you left off without losing the thread. All in all, this sounds like a really interesting project. If you remember sitting in on a rainy day with book in hand and a set of dice in front of you, you’ll probably be hankering for a bit of nostalgia. If the choose you own adventure theme is new to you but you love a good pen and paper RPG, you may well want to watch this project as it unfolds. The Hero of Deathtrap Dungeon is definitely one to keep an eye on. Assuming all goes well, we should be seeing this game appearing on our screens around about this time in 2019.